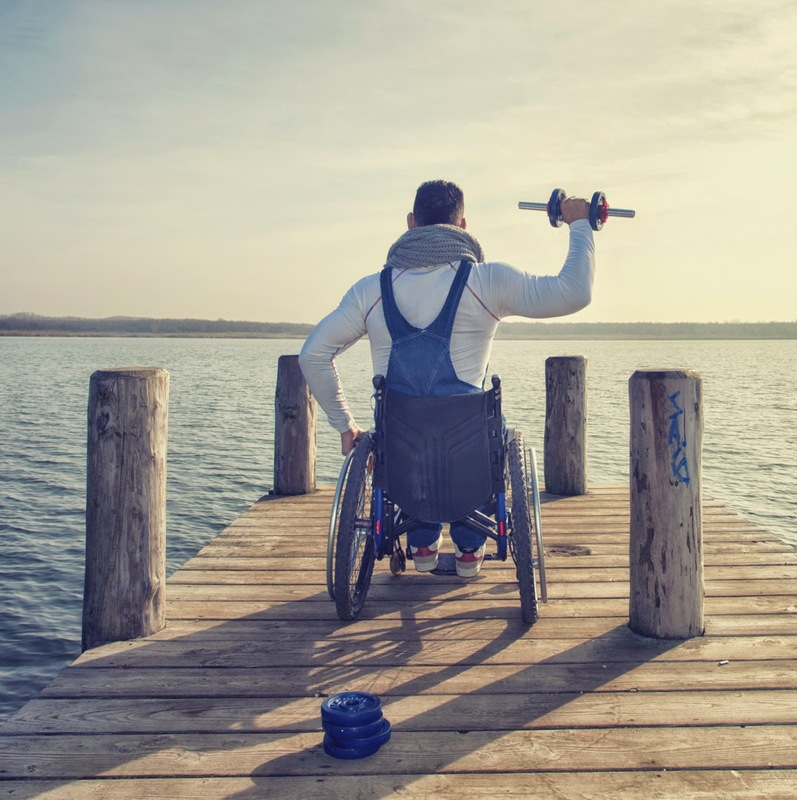 When you’re facing serious mobility challenges due to disabilities, injuries or weight issues, it can be tough to stay active and push your body beyond its disadvantages. However, it has been proven that exercise has the ability to improve physical illness but also alleviate mental unease as well. When your body doesn’t function the way it was made to, it’s not uncommon to go through phases of anxiety, frustration, depression or low self-esteem. And physically, without exercise, you may experience a higher risk of blood clots, body sores and other ailments. Although it will be crucial for you to find work outs that can accommodate to your specific condition, there are a few general guidelines to follow. The U.S. Department of Health and Human Services encourages people with disabilities to do cardiovascular activities for at least 150 minutes of moderate-intensity or 75 minutes of vigorous-intensity a week and two or more sessions of moderate- to high-intensity strength-training activities a week. Upper Body Ergometer – The upper body ergometer is a stationary bike for your hands, which makes it incredibly accessible for wheelchair users. It makes a great sitting exercise machine, and it allows you to pedal with your arms like you would normally pedal your legs on a regular ergometer. Whichever set of limbs you’re cycling in, you’re still raising your heart rate and getting an intense cardio work-out! Water Aerobics – Water aerobics, a popular form of fitness for seniors, is perfect for anyone who needs extra support during their exercise. Water activities lessen the stress fixed on your muscles and joints, making it an effective, yet less intimidating, cardio exercise that still increases your endurance. Resistance Bands – Resistance bands are convenient tools for exercise, because their portability allows you to work out anywhere. Simply tie the band to a sturdy chair, door knob or piece of furniture and pull. The most popular exercises for resistance training are rows, pull-downs and leg and arm extensions. Weights – When it comes to strength training, weights (as well as resistance bands) are efficient ways to build bone and muscle mass, in turn, enhancing your sense of balance and decreasing the chance of sudden falls. You can do bicep curls, shoulder presses, tricep extensions, front raises and more, right from your chair if needed. Weights can be a hassle to lug around and depending on your blood pressure, it might not even be a great idea to lift heavy weights. Use whatever is most comfortable for you, whether that be a ball, water bottle or a set of dumbbells. Stretching – Simply stretching throughout the day can relieve muscle aches and even prevent or postpone muscle atrophy – especially if you’re limited to a wheelchair all day. Stiffness of the muscles often come hand-in-hand with limited mobility, and it’s important to stretch them out and increase your range of motion to prevent further injury and pain. [Chair] Yoga – Yoga has become somewhat of a fad recently, but we can see why! It not only increases your flexibility but it also helps form a healthy state of mind, if you truly open up to it. This wheelchair exercise can also be adapted to people with all different kinds of physical restrictions. For people with mobility issues, group classes, private instructors and even online videos of Chair Yoga are available. Most importantly, exercise should be fun. You don’t have to give up playing your favorite sport or activities, because you don’t have full use of your arms or legs. There is a huge community of organizations that focuses on recreational activities and sports specifically for people with limited mobility. Don’t let your injury or disability get the best of you. Your body is capable of outstanding things, and we, at Preferred Health Choice, only aim to make that easier.